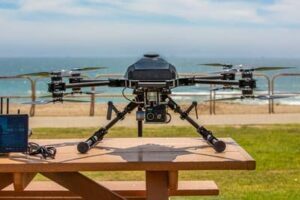 xG Technology, developer of the IMT and Vislink live video communications systems, has announced that it has entered into a partnership with K2 Unmanned Systems to develop K2’s new law enforcement tactical drone, the Knight Hawk. IMT Vislink is providing interoperable, encrypted HD video downlink technology for use with the Knight Hawk, which is the first U.S.-designed and assembled law enforcement tactical UAV (unmanned aerial vehicle). K2 announced the release of the Knight Hawk at the 29th Annual APSA Fly-In Training, a private event hosted by the Pasadena Police Department to network, and train, and display new technologies. IMT Vislink downlink technology is fully compatible with regional agencies’ large platform, fixed, and rotary wing surveillance aircraft platforms, allowing for dual use of current portable and mobile command vehicle downlink receive systems. The IMT Vislink downlink systems are built around an “air-to-anywhere” philosophy that allows real-time video to be collected, distributed and managed across all deployed assets. The Knight Hawk is a commercial grade UAV designed with first responder operations and infrastructure inspection in mind. Its high pound payload capacity, infrared optics, and encrypted HD video downlink make it ideal for critical situations.